I did this hike on a weeday before I left to work. 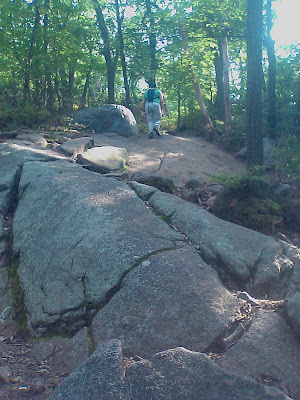 It was a really nice summer day and I am still trying to get in as much hiking as I can before the summer is over. 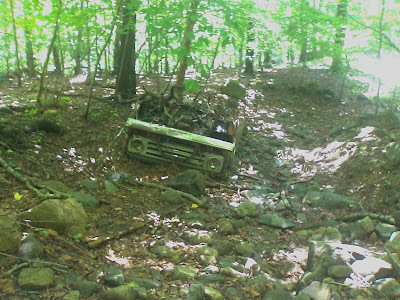 Parked on Call Hollow Road at the trailhead of the Long Path, and took the Long Path up to Old Turnpike. 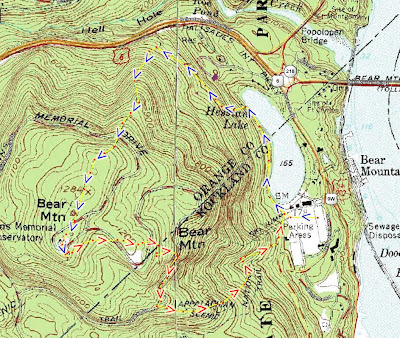 After going briefly on Old Turnpike made a turn north onto an unnamed woods road which led to the Suffern Bear Mountain (SBM) Trail. 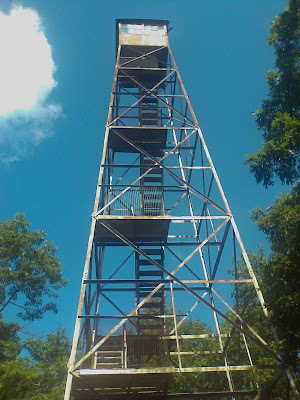 Took the SBM Trail from there west past the Radio Tower and to the Fire Tower, which I climbed. 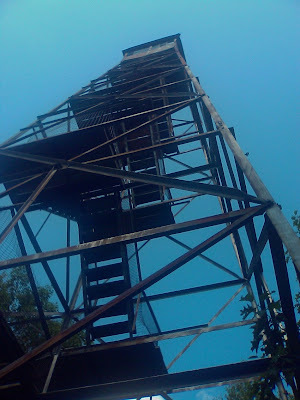 The Fire Tower is old and rickety and it is not a climb for the faint of nerves. The very top is locked but you can still get an unparalled panorama from all points right near the very top. Climbed back down and took the same route back. 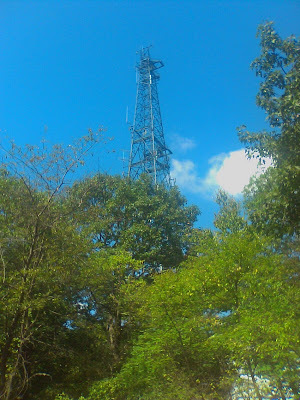 This tower can be seen from almost all summits in the park. 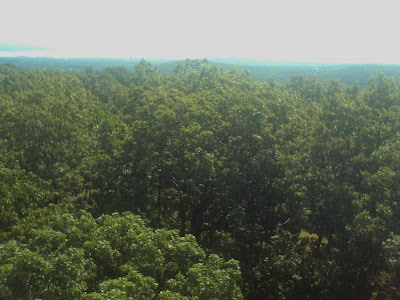 View from Fire Tower facing South. 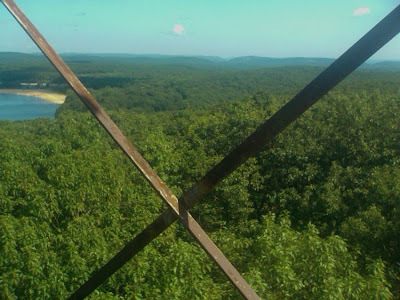 View from Fire Tower facing East. Towards Hudson River and Hi-Tor. 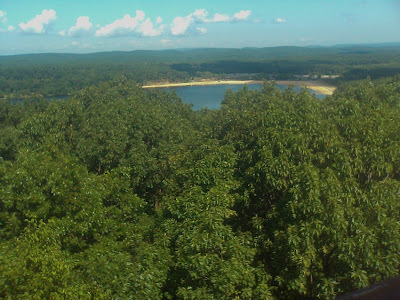 View from Fire Tower facing North. Towards Bear Mnt. 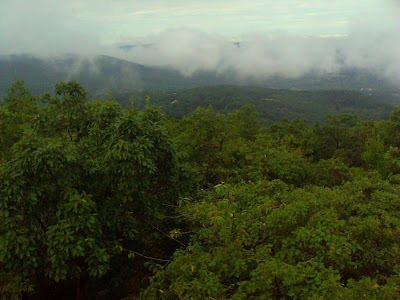 and West Mnt. 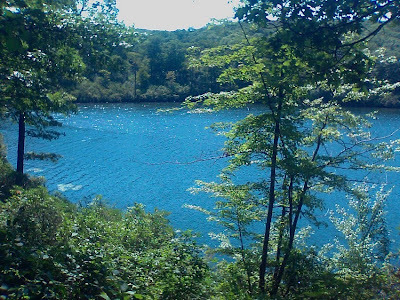 Lake Welch on the left side. 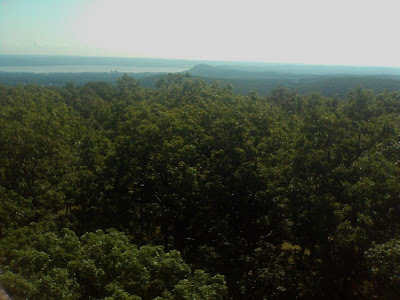 View from Fire Tower facing West. Another shot directly below the Fire Tower. I haven't been to Storm King in a long time and had forgotten what a great mountain this is. 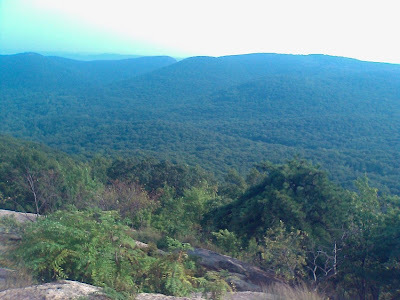 It offers continuous views throughout the hike and is one of the best hike's in the area when it comes to view points. 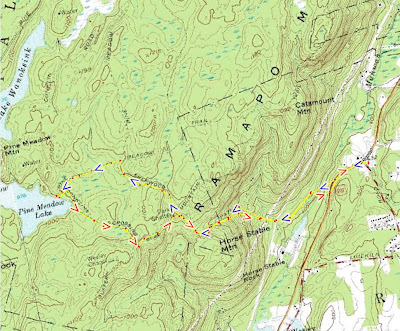 I had intented upon taken a longer route but Shimmy had hurt his foot the prior week and in the middle of the hike needed to bail out early due to his foot pain which was rekindled. We started at the parking area on Rt. 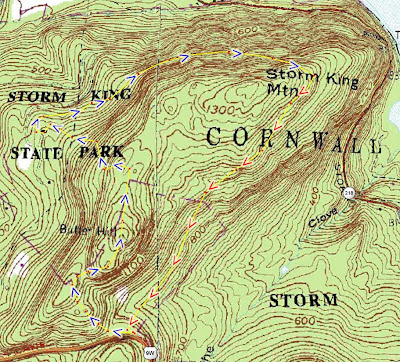 9W and took the yellow-blazed Stillman Trail up to the rocky summit of Butter Hill. This is a short but steep climb. 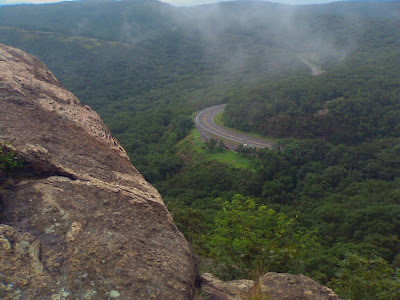 Atop Butter Hill, which is actually the true summit of Storm King Mountain at 1380 feet, there is a great view looking back at 9W, and across The Clove to the Crow's Nest. 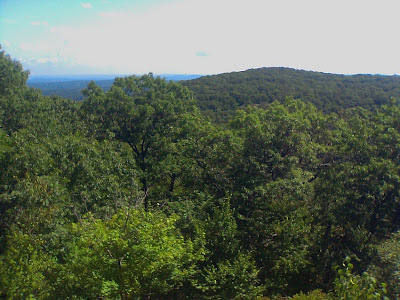 Continuing along the trail you can also see views west to Schunemunk Mountain and the small towns of Orange County. 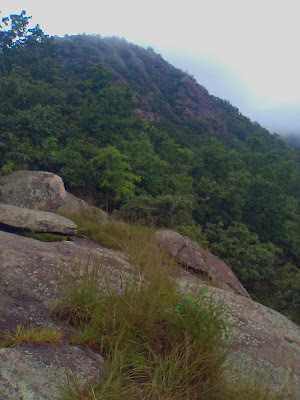 The weather was rainy so the views were a bit obscured, but it did clear up in the middle of the hike. 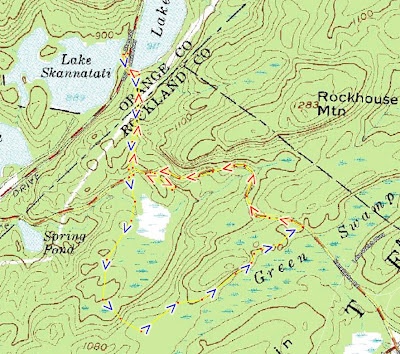 We veered off the Stillman Trail to the Bluebird Trail, and took the Bluebird trail partially down the mountain and back again to the Stillman Trail, where we ascending back up on the northern side of the mountain. 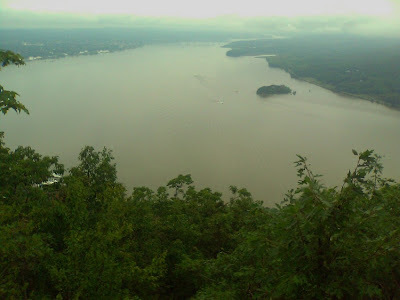 This part of the trail affords great views of Newburgh and the Newburgh Bay on the Hudson River directly below the mountain. The Stillman trail bears south at the edge of the mountain, and then hits this unbelievable view which overlooks the south and the east. Directly across the river is Bull Hill (Mt. Taurus) and to the south is the Crow's Nest. From the view took the Bypass Trail back straight toward the parking area. Once again I only had my phone camera so photo quality is poor. Butter Hill from the trailhead. 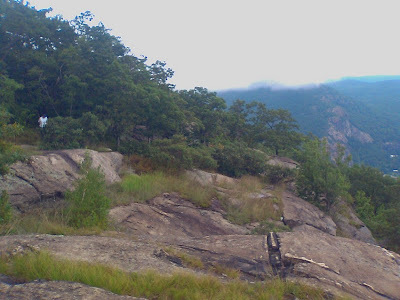 Storm King Mountain is covered in clouds. Newburgh Bay with Pollopel Island. 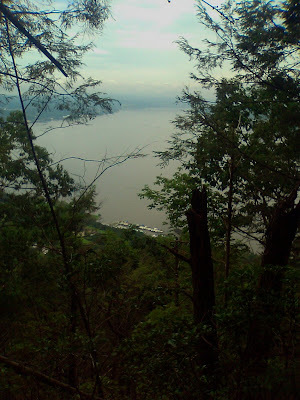 Facing south towards Cold Spring across the Hudson. 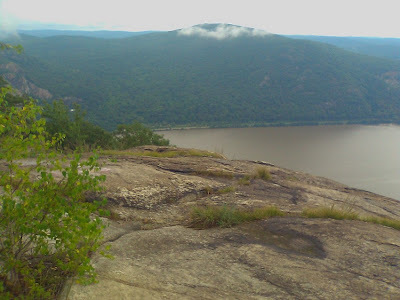 Breakneck Ridge across the river. 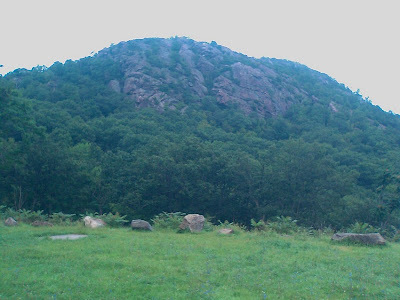 Bull Hill (Mt. Taurus) across the Hudson. parking area. Butter Hill is up ahead. Signs at the parking area off Rt. 9W. I took the afternoon off from work to do this hike. This was a real hot and muggy day, during the hottest week of the summer. 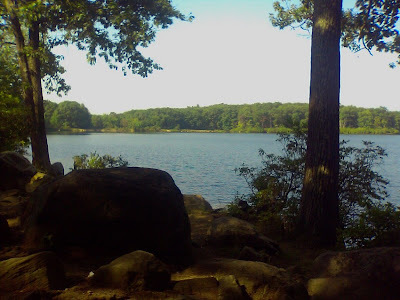 We started at the Bear Mountain parking lot, and walked toward Hessian Lake and picked up the Major Welch Trail going along the west side of the lake as a paved path. 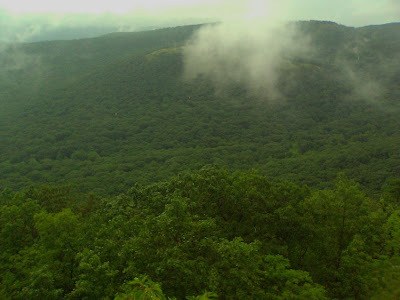 Then we continued along the Major Welch trail and ascended the mountain. 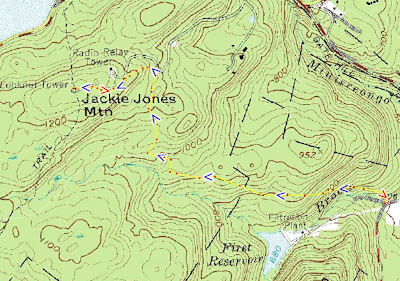 The main ascent is a strenuous climb on top of steep rock faces and has some good scrambling points. 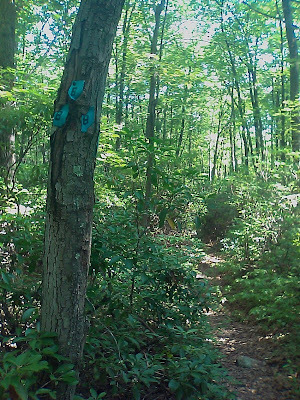 I rarely take this trail up - I usually climb up the Appalachian Trail and take the Major Welch down. 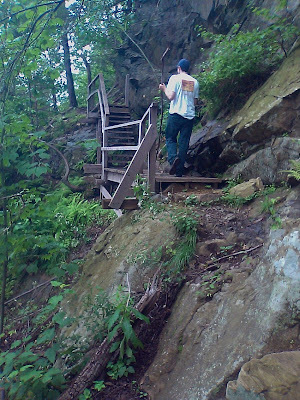 But Yehuda wanted to go up the Major Welch this time. We were sweating profusely due to the heat and terrible humidity. 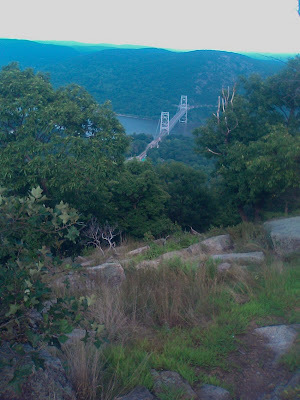 About 3/4 the way up there is a phenomenal viewpoint where the entire north is clearly visible, and the Bear Mountain Bridge stands below crossing the Hudson. 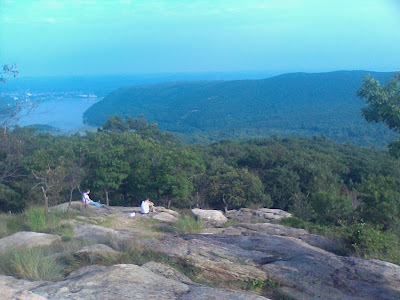 This is a very famous view and is a photo highlight of Bear Mountain. 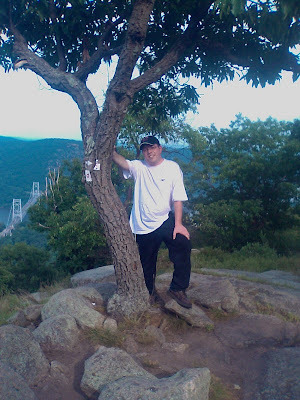 We continued up the summit, passed along the Perkins Tower, and then headed back down via the Appalachian Trail. 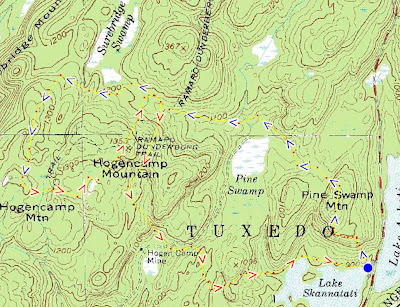 Just a note of history here: The Appalachian Trail, which is no doubt the most famous hiking trail in the world, had its first portion created over Bear Mountain. 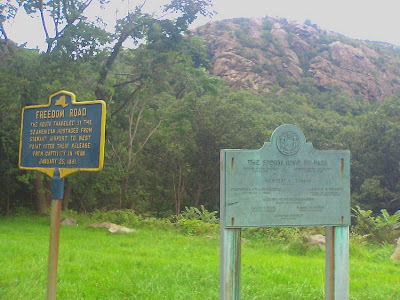 And at the foot of Bear Mountain the trail reaches its lowest point along its 2,178 mile-long route. There was a sign near the top (where the trail leaves the Perkins Drive extension at the dead end) stating that the trail will be re-routed due to erosion. 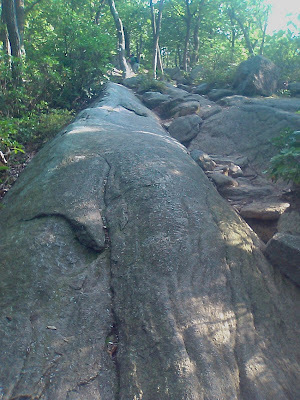 The way down has recently become extremely eroded due to the exceeding high volume of hikers that climb up this trail. 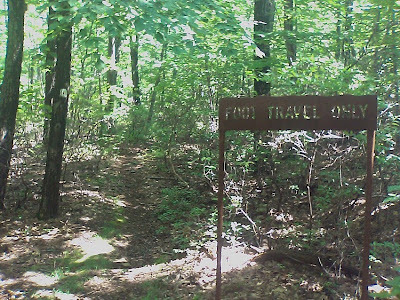 I take this trail often and the erosion has just been terrible lately, so I am glad they are doing something about it. Continued down the mountain and then met my wife for a barbecue at the Picnic area at the bottom. There is also a vintage car show every Wednesday night in late August which we enjoyed after the barbecue. NOTE: My camera was sent in for repairs. The photo quality is poor as the photos were taken with my phone camera. 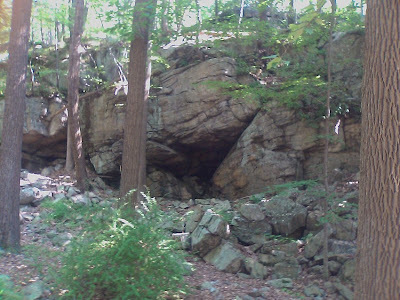 Rock Climb on Major Welch. You can see Yehuda on the top. 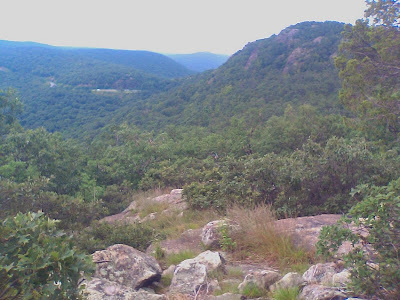 View facing north on the ascent of Major Welch. 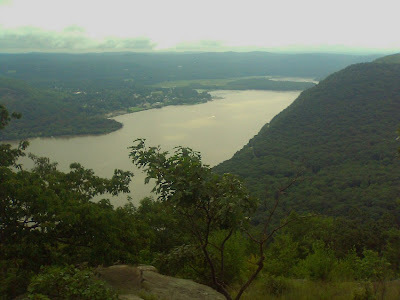 Hudson River and norther Highlands. 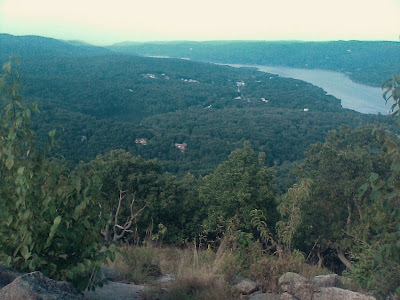 the Hudson, and Peekstill from summit. Yehuda at the summit. Facing southwest. 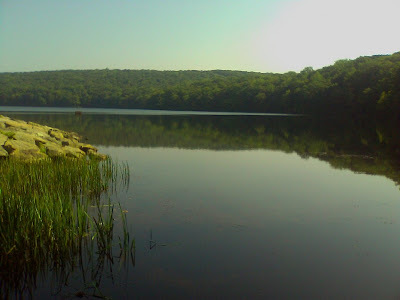 I took a quick morning hike before coming into work - trying to get in as much as I can before the end of the summer. 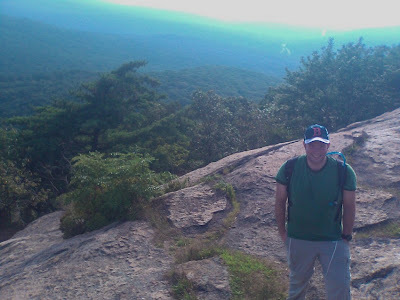 My goal was to do a hike that is short and not strenuous. 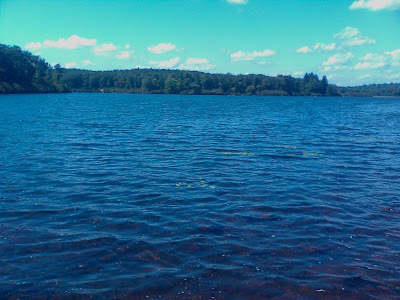 I parked at the parking area at Lake Skanatati off 7 Lakes Drive, and took some good photos of both Lake Skanatati and Lake Askoti (I wish I had my good camera which I had sent in to be repaired). Took the Long Path south up and past Gate Hill Road, and then to Beech Trail. Turned east on the Beech Trail to Gate Hill Road, and walked back towards the Long Path along the side of the road. 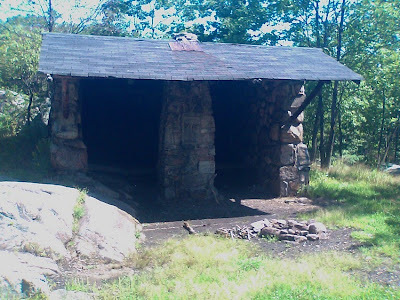 I had always wondered what the "Rock House" was on the map, so went off the road to a short unmarked path off the road near the location on the Trail Conference Map describing the location of the "Rock House". 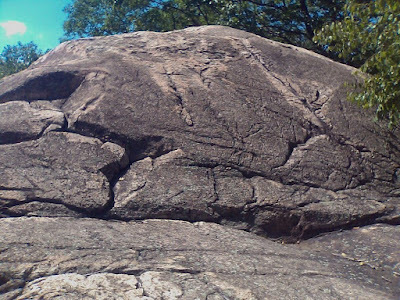 It seems that it is a large rock face along the edge of a cliff with a cave-like hole in it. I took some photos and continued back to the Long Path and back to the car. Lake Skanatati. At the trailhead. Taken from cell phone camera. Imagine this shot from a real camera! 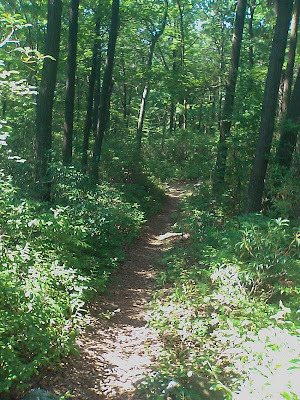 Beginning of the Beech Trail at the Long Path.